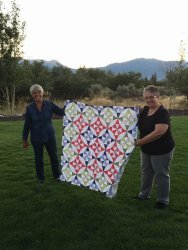 Learn to make this beautiful "Block Party" project, make new friends, and enjoy the beautiful mountain views at a Jillily Studio Quilt Retreat with National Teacher, Jill Finley, and Margaret Brockbank near Park City, Utah! 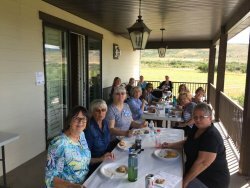 The last year's retreats were such a success, we've decided to do four different retreat times next summer. Choose which date works best for you! 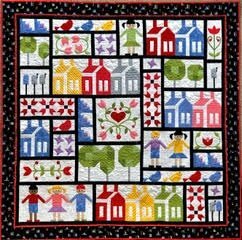 Our project this year is Jill’s new quilt, “Block Party” using Jill's “Home Again” fabric line with Penny Rose Fabrics. The pattern will be available in spring 2019. 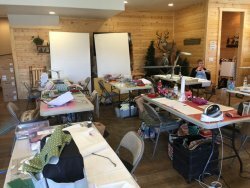 Jill and Margaret will provide personalized instruction for precision piecing, beautiful appliqué, and much more! Learn about choosing fabric, design elements, and lots of tips and tricks for quilting and applique. Break-out classes will offer technique classes and mini projects. Bring your own machine, or rent one at the cabin (reserve ahead). *Note: Jillily Studio will have many quilty items available for you to purchase in case you need some extra supplies such as Aurifil Thread, notions, patterns, and of course fabric! Each day we will serve 3 wonderful, home-cooked meals. We will try to accommodate special dietary needs if you let us know. We will provide one set of bedding and towels for attendees. No Pets. Smoke-free. Alcohol free. *Although we would prefer that the facility remains alcohol-free, we understand that persons on retreat occasionally like to enjoy an alcoholic beverage. However, we strongly discourage excessive alcohol consumption and reserve the right to remove any guest for disorderly conduct. 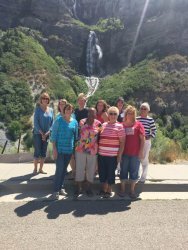 Contact jill@jillilystudio.com with questions regarding the retreat. View brochure. Download the registration form here.